After reviewing a set of quantitative factors, Citi analysts conclude that a sustained market correction is not imminent but investors should not be complacent. With the global equity bull market in its eight year, investors are likely to be wondering if equity markets can continue to rise further. To answer that, Citi analysts examined a number of quantitative factors in Europe and the US. Citi analysts first note that the percentage of stocks making new highs in both markets is rising. This suggests that the current market strength is well supported. Next, unlike the tech bubble from 1997 to 2001 where only a small percentage of stocks outperformed the broader market, this is currently not the case in Europe and the US. 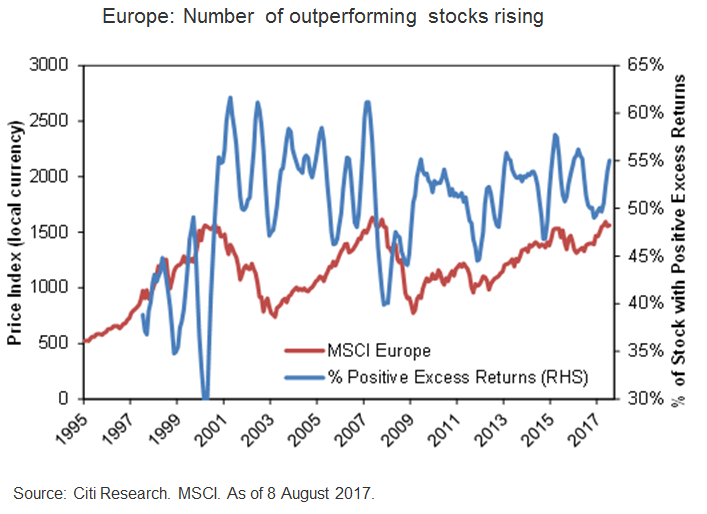 In particular, for Europe, the number of outperforming stocks is increasing, which is a sign of a healthy market. Typically, as a market rally matures and a smaller number of stocks drives the market higher, the differences in the returns across stocks widen. According to Citi analysts, the differences between individual stock returns remain small although the low interest rate environment and asset purchases by global central banks could be helping to compress overall market volatility. Citi analysts conclude that a sustained market correction is not imminent but investors should not be complacent. Valuations are no longer cheap for many markets and Fed tightening as well as geopolitical tensions could increase market fluctuations. Citi analysts continue to advocate that investors keep their portfolios diversified by investing in equities. They favour European and Emerging Market equities where valuations are more attractive and economic fundamentals are improving.